Climbers in Ontario: we need your help! The Government of Ontario has been conducting a co-ordinated land use planning review since February 2015, and in its latest draft, rock climbing has quietly come under attack. 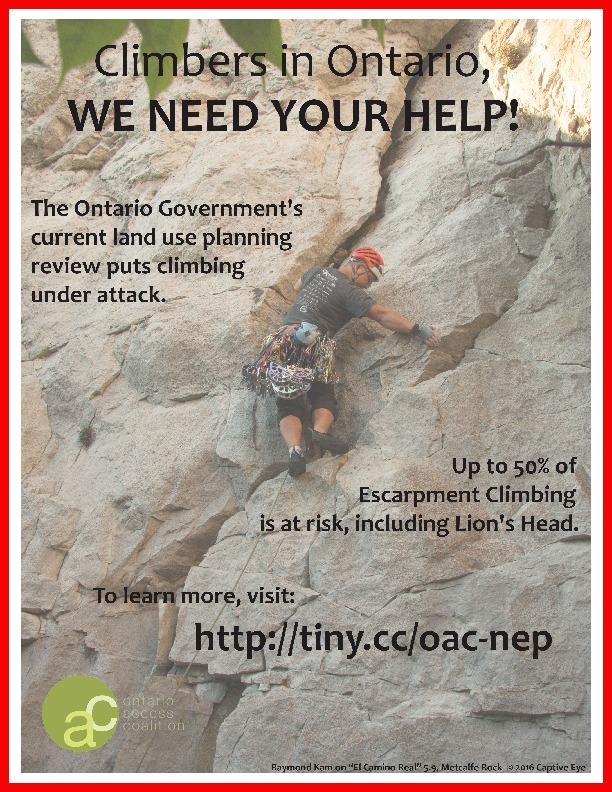 The OAC believes the proposed Niagara Escarpment Plan (NEP) amendments put rock climbing access at significant risk, especially within Ontario Parks. Ontario climbers could lose 50% of Escarpment climbing areas, including Lion’s Head. We, the Ontario Access Coalition, have been representing climbers throughout this review. We’ve provided extensive feedback and attended meetings to offer advice for the future management of rock climbing in Ontario within the Niagara Escarpment Plan as part of the Provincial co-ordinated land use planning review. Now is the time, as climbers, to speak up and to let the Government of Ontario know that rock climbing must be considered a compatible outdoor recreation use on Niagara Escarpment lands. We will be starting our efforts with the NEC. In later stages, the OAC will provide information and OAC form letters for other relevant government recipients. We ask that ALL climbers send in comments/letters to the Ministry so our community is heard (see link and instructions below). Your comments supporting rock climbing in Ontario must be received by the October 31, 2016 deadline. Follow the instructions below to use the sample letter, (better) customize our letter, or (best) write your own. The more submissions we get to the government the better, so enlist your friends and family to write letters too. If you are using the OAC form letter, generate it and save the resulting PDF, by following this link: Niagara Escarpment Plan Form Letter Generator. Please note: You are opening a Ministry of Municipal Affairs and the Ministry of Housing page. Complete all of the required fields in the form. Because of a technical glitch on the Ministry site, it is best to attach your letter as a PDF file (Niagara Escarpment Plan Form Letter Generator.) File sizes must be 5mb or less. Use the preview function to double-check your information made it onto the site. Note: you only have 30 minutes to complete the form before you have to start over. Feel free to copy and paste the entire sample letter, or customize it, or write your own. The sample letter will give you a sense of what some of the major issues are. We can use all the help we can get, so more is better! We need you to get everyone you can to submit letters by Oct. 31, 2016 to protect the future of Ontario climbing. PS – Just in case we didn’t make it clear, MORE IS BETTER! The proposed Niagara Escarpment Plan needs to explicitly state that rock climbing is a compatible outdoor recreation use. As outlined in the Ontario Climbing Access Coalition’s (OAC) feedback in 2015 (https://www.ontarioallianceofclimbers.ca/wp-content/uploads/2015/06/Ontario-Rock-Climbing-Access-Coalition-Co-ordinated-Review-Response.pdf) I’m exasperated to see that rock climbing has not been deemed a compatible use and has not been acknowledged as an historic, current, and acceptable recreational activity along the Niagara Escarpment within the proposed NEP. Rock climbers have done more to protect and monitor Niagara Escarpment lands than any other user group. The proposed NEP amendments, all management plans that go forward, and associated policy, must all be balanced with previous research recommendations stating that future land use within provincial agencies, such as within Ontario Parks, need to be more effectively managed to rebuild trust. The proposed NEP does not effectively integrate past research that should be directing policy and future management planning. I believe an NEP-wide climbing management guideline (beyond individual site management plans) needs to appear within the proposed NEP. Past recommendations from Ontario cliff-face research recommends keeping Ontario climbing areas open through best practices. I have grown increasingly frustrated and impatient with the province of Ontario for not being able to adopt more proactive, modern, and sustainable approaches toward outdoor recreation resource management that clearly work well in other parts of the world and which effectively find balance between use and protection of the natural environment. It is my sincere hope that the new NEP will lead to real change that benefits the public and the natural environment and which takes into consideration the 100+ years of rock climbing history in the Province.